Get Your Tickets To Kalin & Myles ‘Dedication Tour’ NOW! Woo-hooo!! How happy are all you Kalin & Myles fans right now? Most likely squealing with joy at the thought of them heading out on tour again! 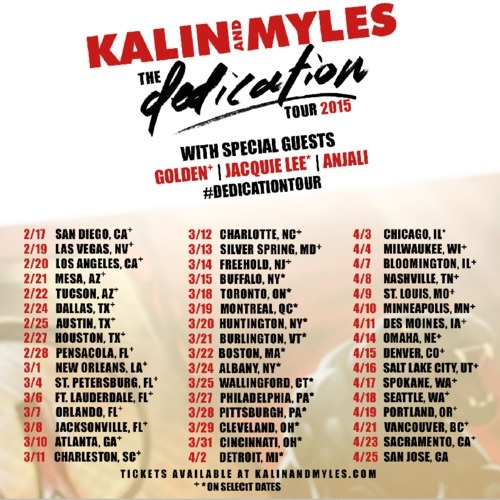 Beginning in February, Kalin & Myles are heading out on their Dedication Tour 2015 with special guests, Golden, Jacquie Lee and Anjali! And right now, you can grab your tickets for this awesome tour! You can check out which cities they’re heading to above, then head to KalinandMyles.com to purchase your tickets now!